So this is it! The Kickstarter for The Mole, a swift, orderly return to classic platforming, goes live tonight at midnight (Eastern Time, of course). And it just so happens that The Mole’s Greenlight campaign goes live over at Steam at the same time. What a coincidence? Hang tight, I’ll post the links as soon as everything is live, and an enormo-thank you to all those out there supporting me. This should be an amazing month regardless of the outcome! EDIT: As promised here are the links to the Kickstarter as well as Greenlight, where you can vote to get The Mole on Steam! 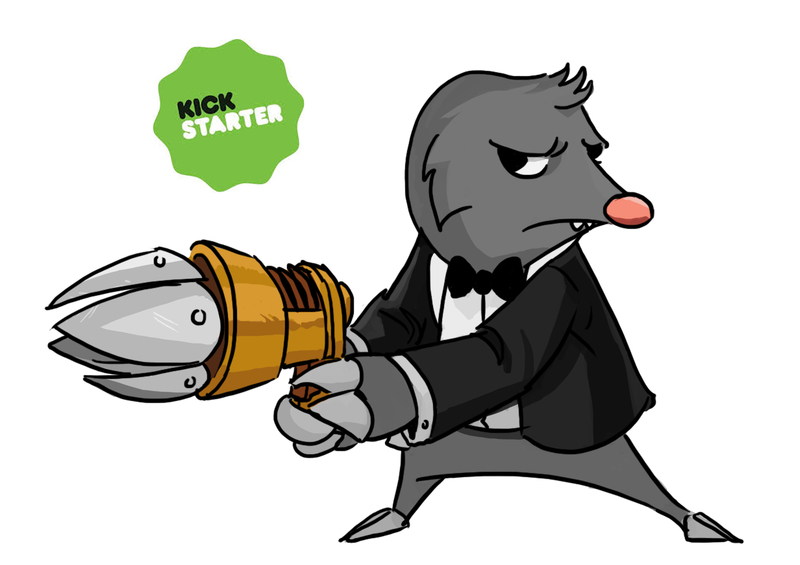 Here it is, the first tech demo for The Mole. Let me know what you think in the comments, if it looks boring, or if you think I could improve it in some way. If you’re looking to make something like this for your own project, get in touch with me and maybe I can help. I had to go back and brush up on my high school algebra for this one. I did a lot of research on parabolas, trajectories, and that sort of thing, so if you’re trying to figure out where a grenade is going to land or how much force a rocket needs to barely clear a house, just shoot me an email at evanbarmes@gmail.com and I’ll see if I can help. Secondly, if you are at all interested in game design pertaining to UI check out this post by Anthony Stonehouse over on Gamasutra. I think my first encounter with diegetic UI design was playing Heavy Rain. I thought it definitely helped to keep the player immersed in the game world since there were no 2D HUD elements to flatten out the game space, but a more relevant UI category to talk about is spacial. As I stated in my last post, The Mole will borrow some ideas from Dishonored when it comes to spacial UI design. I intend on developing some sort of system, temporarily deemed “Mole Sense” for lack of a better term thus far, that will allow the secret agent-esqe mole to do things like see through walls, see where his grappling hook will land ahead of time, see sound waves, and other things. Once again, designing this system for a 2D space will take some heavy altering, but I want the UI elements involved with Mole Sense to be as closely integrated into the game world as I can make them. Thanks again to all my followers and any new viewers for checking out my blog. Let you know what else I’m currently playing to study up for the development of Animalia.